The bite force is determined by the width of the tops skull (width between ear to ear) and the how big the muscle is that connects from the top skull to the lower jaw. If the dog has a wide lower jaw then it would be common sence to determine there is more muscle. The picture to the left is our 10 month old male Rottweiler puppy. As you can see the distance from the teeth to the outer jaw is very wide. This means there is a lot of muscle coming down from the top skull. This puppy's head is larger than even the Rottweiler in the bite force video, and he still will grow up to 32 months old or more. 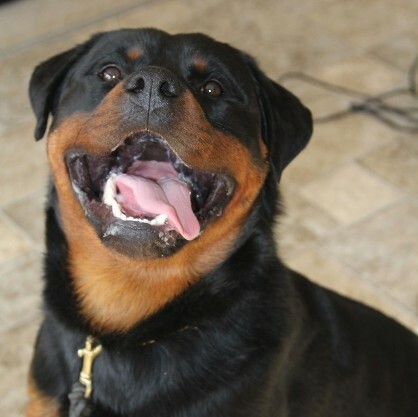 Most Rottweiler have small narrow jaws, this is in the genetics of the dog.